On May 30, 2006, a discussion arose concerning inscriptions used by the various German postal administrations following World War II. Colin Judd wrote the following information and made the accompanying illustration. postal administrations in Postwar Germany. The numbers used in the following refer to the examples in the image above. The italicized word in parenthesis is the inscriptioin used by that postal administration. 1. 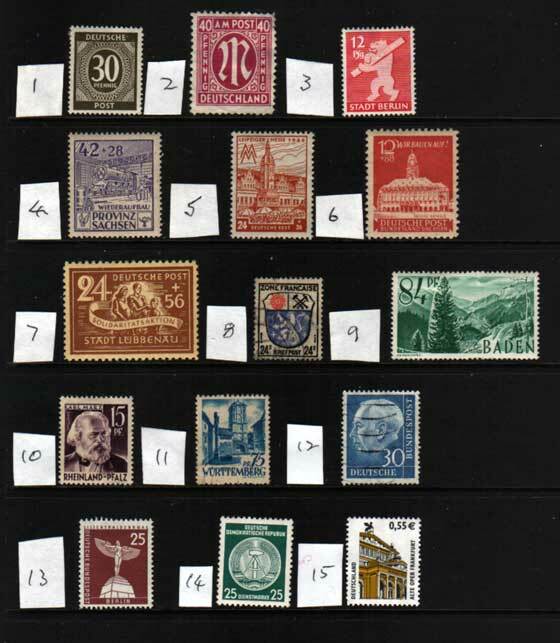 After the defeat of Germany at the end of the 2nd World War, Stamps were issued for all Germany, British, American and Russian Zones (Deutsche Post), then the country was divided, and Berlin was divided into Russian Zone and the 2. Allied, American & British (Deutschland) Zone. The Soviets issued stamps for various sub zones: 3. Berlin Brandenberg (Stadt Berlin), 4. Saxony, Halle province (Provinz Sachsen), 5. West Saxony, Leipzig Province (Deutsche Post), 6. East Saxony, Dresden Province (Post), and 7. Thuringia, Erfurt Province (Deutsche Post). France was added as an occupying power and they issued their own stamps: 8. 1947 general issue – (Zone Francais) and Provinces, 9. (Baden), 10 (Rheinland Pfalz), and 11. (Wurttemberg). 12. From 21st Sept 1948 the former British, American and French Zones issued unified stamps (Deutsch Bundespost) and, as Berlin was also divided, 13. the Allied Zone issued stamps (Deutsch Bundespost Berlin). 15. When Germany was unified in 1990, stamps for the nation were issued (Deutschland).